Science Teaching as a Profession: Why It Isn’t. How It Could Be. Belatedly, it will seem to many teachers, efforts to improve K–12 education have put the classroom teacher back on center stage. After decades of innovation in the use of computers, the web, and other pedagogically rich devices, researchers on all sides of the political spectrum are converging on what is really an old-fashioned view: Student achievement depends mainly on the quality of instruction as created and conveyed by the teacher in the classroom. But instead of gaining more autonomy and control over what he or she teaches and how, today’s classroom teacher is becoming a prisoner of high-stakes testing of pupils’ achievement gains. That’s the gist of the revolution launched in 2002 by the No Child Left Behind Act (NCLB). Teacher “quality” is deemed directly responsible for pupils’ achievement. And the obverse: Where pupils’ gains are subpar, it is the teachers’ fault. Science teaching as a profession was already under siege when this new century began. Mostly absent from school and school district leadership, secondary science teachers, and in particular science chairs, have looked on helplessly as the ground shifts beneath them. Spokespeople for science education have been largely scientists! This is not entirely inappropriate. After all, science as a profession depends on high-quality recruits. Nor can we do without the science education research community. But science teachers have a unique expertise, and they are not usually invited to the table where decisions that affect their work are made. Science teachers are not averse to having their own students’ achievements factored into the equation. To the contrary, they look forward to having science put back on the front burner from which it has been dislodged by math and reading. Our proposition is simple but revolutionary. 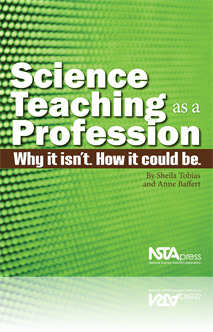 Until and unless science teachers are given back substantial control of the subjects they teach, including curriculum content, pedagogy, pacing, and assessment, and successfully recruited into leadership at the school, district, state, and national levels, we will not have robust student achievement.